What is the Cost to Create a Will? At Puff & Cockerill, the cost to create a will package can be roughly $450 for an individual, and for a couple roughly $850. All families and estates are different, and the cost will depend upon the difficulty of the drafting. Additionally, these fees are quoted for simple wills without any tax planning. For more complicated dual family situations, trusts or more difficult or time consuming wishes of a client, the cost can run as high as $1,250 or higher. This package can ensure that an individual’s wishes and objectives are met, that their chosen beneficiaries (i.e., your spouse, children, and loved ones) are provided for and that power is entrusted in the right people in the event your health declines. All of which creates peace of mind for the individual or couple and can alleviate family stress. Simple Will: A simple will is a will through which an individual leaves their entire estate outright to chosen beneficiaries in equal shares to your spouse, children or siblings. 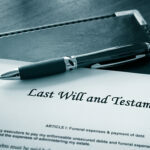 In other words, a simple will differs from a more complex type of will, whereby an individual wishes to leave portions of their estate in trust or at varying percentages to several beneficiaries. If you wish to create a will that is more complex, which may include trust agreements, an additional fee will be included in the package. Living Will: A living will is written statement directing your medical providers and family as to how you wish to be treated in certain medical situations. A living will allows an individual to describe the type of treatment they would want if they become critically ill and specifies their wishes in terms of end-of-life care. Through a living will, you can explain to your family members, in advance, the types of treatment you deem worthy of continuing. Power of Attorney: A power of attorney permits someone of your choice the power to act in your place. In the event that you become mentally incapable, a power of attorney authorizes your chosen person (your agent or attorney-in-fact) to make and handle financial decisions on your behalf. Medical Power of Attorney: A medical power of attorney permits someone of your choice the power to act in your place in the event you cannot communicate your medical wishes. A medical power of attorney enables doctors and medical practitioners with an understanding of how you wish to (or not to) be treated. A medical power of attorney differs from a Living Will in that a Living Will is focused on end-of-life care. Special Needs Trusts for families who have disabled children must be quoted separately. For more information the cost to create a will package or to speak with an estate planning attorney, please feel free to contact an experienced attorney. An experienced attorney may help you (and your spouse) understand the benefits and details of these documents in a way that will effectuate your goals and objectives for planning your estate and providing for your loved ones. Comments Off on What is the Cost to Create a Will?